The question “How hard can it be?” is possibly the worst that a homeowner should use as the baseline to decide whether to carry out repair work in a home improvement project. Daring DIYers view home repairs project as simple, especially if they have seen a professional do it before. It may seem as if no job is too large for their capable hands when they have the right tools, but looks can be deceiving. The most important part of a house, the roof, is no simple task for many reasons. The roof is actually what makes a house a home, which means that any kind of repair or renovation carried out on it is a lot more important than many homeowners realize. If you are considering carrying out rood repairs or renovations for your next home improvement project, there are some that you should not attempt, no matter how clear the videos you watched online explaining every step are. At a time when every cent you save counts, you may be tempted to give a professional contractor a pass but we will explain just why not all repairs and renovations are best left to the experts with years of training and experience. Cleaning gutters is simple—in fact it is recommended that you remove leaves that could block the drainage every few weeks or months to allow water to flow freely from the roof to designated collection points. However, when the gutters are blocked, crooked, or damaged at the collection point, they will need to be straightened and patched properly before they can work well again. Gutters are very sensitive, not only because of the light materials they are made from, but also how they are attached to the wall of the house. Only a professional will understand how the different pieces of the gutter need to be re-aligned to ensure water flows in the right direction and that the repairs or replacements done do not cause more harm to the roof shingles and wall brackets. 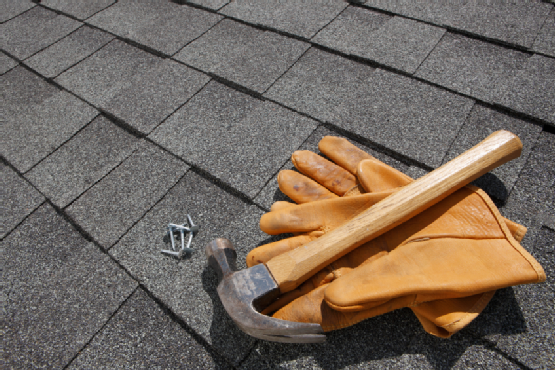 One of the most difficult repair jobs to carry out on a roof is the repair or replacement of damaged shingles. Most homeowners typically prefer to put off the repair of damaged shingles—provided they do not leak—opting instead to schedule repairs during the next ‘big renovation’. This often leads to the damage getting worse over time, leading to the damage of neighboring shingles that eventually lead to leaks and structural damage to the roof structure. Homeowners who choose grab a ladder on a Saturday morning and attempt repairs or replacement themselves not only put themselves in risk of falling off the roof but may also cause more damage that will eventually cost them more to get a professional to fix. Depending on the type of your roof, it is probably best to hire a contractor for any shingles repair or replacement work. The main reason that roof inspection is not recommended for a do-it-yourself project is that it is easy to slide and fall off. Getting up and down the roof and carrying all the tools you need to repair or inspect the roof poses a great risk of injury or even death. It is a very tiring job that makes you progressively more prone to mistakes. Whether you want to inspect a small leak or are concerned that the structure of your roof may demand that you replace the entire roof, it is probably best not to do it yourself. Inspecting a roof may mean getting to every point of it, examining each part, and even testing the strength of the underlying structure. There are a lot of metrics that come into play to determine its state and rigidity that you do not know. Most reputable DIY sites for homeowners on the internet do not recommend that you carry out any major repairs or makeover projects on your roof for many reasons. You could fix a few minor problems here and there but you should never bite off more than you can chew. Roofing work requires properly trained and experienced hands to get it right, and if mistakes are made even during minor repairs, the damage they could cause could be very expensive.